The University of Warwick School of Life Sciences has been asked by a number of growers to test Chillies to ascertain their heat level on the Scoville Scale. Each of those tests has been done as a commercial service to those clients and the University has not publicized or press released any of the results. 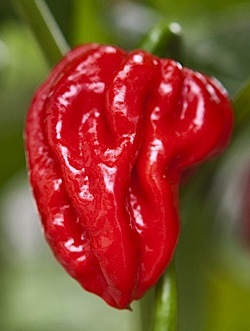 One of those clients recently asked us to test a Chilli they described as a “Naga Viper”. We completed the test and gave the results to the client. We have since seen a number of media publish those results under headlines that this indicates that the tested Chilli is the hottest in the world. We also understand from news reports that there has been some interest in having this published as a fact in the Guinness Book of Records. While we cannot release our full report on this Chilli without the commercial client’s express permission, we can say that we feel that any result obtained from the Chilli sample that was tested by us should be viewed as only a good indicator that this Chilli could meet the conditions of entry into the Guinness Book of Records. The sample provided to us was relatively small and, while we do not know explicitly what the Guinness Book of Records testing requirements would be, we would expect that they would require at least one more test with a larger sample and possibly a corroborating test in another lab. Fiery Foods Team to Try for “Hottest Chile” Record The “True Chili Capsicum” The Chile Way to Burn Fat and Boost Metabolism Break Out of the Winter Doldrums!